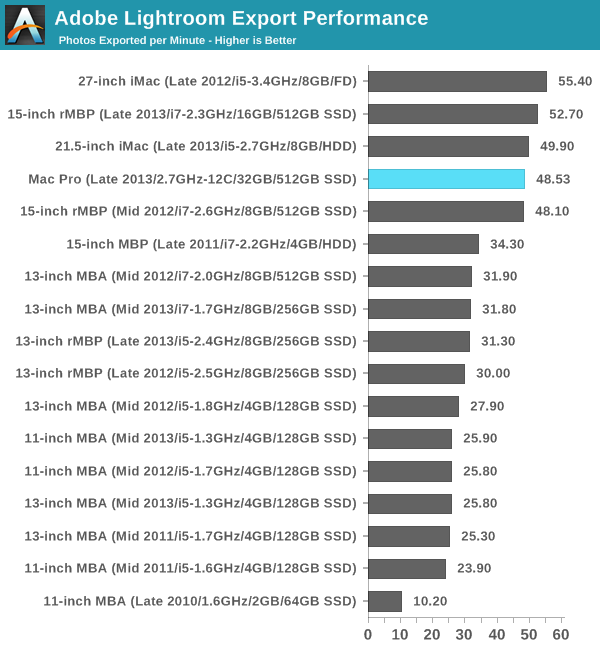 For my final set of CPU performance charts I put the new Mac Pro through the same set of tests I do all new Macs. There are definitely multithreaded components to these tests (some are indeed highly threaded), but the suite also values good single threaded performance. Here we'll get an idea of how the new Mac Pro, in its most expensive configuration, fares as a normal Mac. If there's one graph that tells the story of why Intel's workstation roadmap is ridiculous, it's this one. The Mac Pro follows Intel's workstation roadmap, which ends up being cut down versions of Intel's server silicon, which happens to be a generation behind what you can get on the desktop. So while the latest iMac and MacBook Pro ship with Intel's latest Haswell cores, the Mac Pro uses what those machines had a year ago: Ivy Bridge. Granted everything else around the CPU cores is beefed up (there's more cache, many more PCIe lanes, etc...), but single threaded performance does suffer as a result. Now part of this is exaggerated by the fact that I'm reviewing the 2.7GHz 12-core Mac Pro configuration. Single core turbo tops out at 3.5GHz vs. 3.9GHz for the rest of the parts. 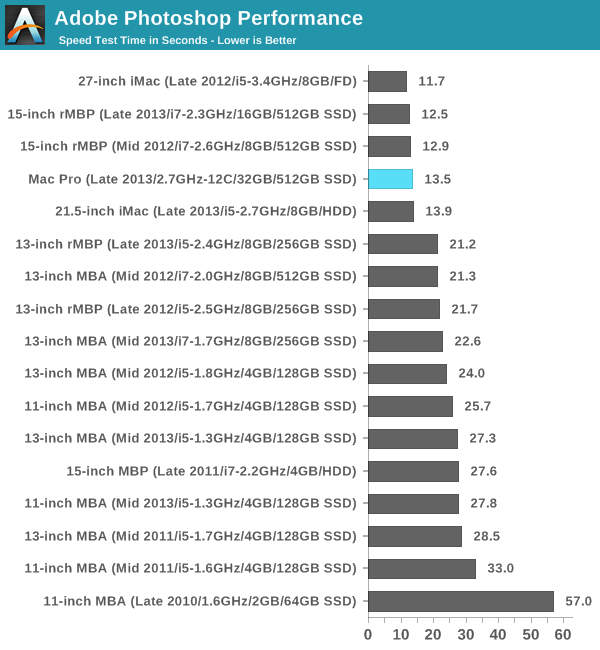 I suspect if you had one of the 8-core models you'd see peak single threaded performance similar to what the 2012 27-inch iMac delivers. 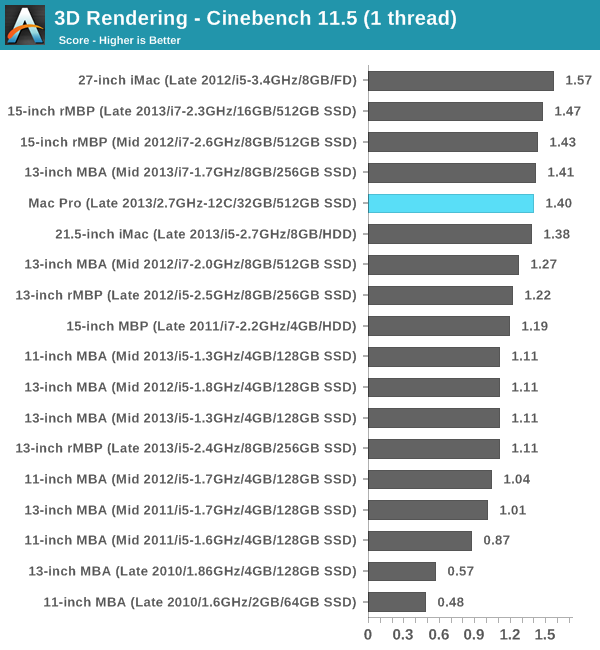 The 2013 27-inch iMac with its fastest CPU should still be quicker though. We're not talking about huge margins of victory here, a matter of a handful of percent, but as a much more expensive machine it's frustrating to not see huge performance leadership in all areas. If you need more cores, the Mac Pro is literally the only solution Apple offers that can deliver. We're talking about multiple times the performance offered by anything else in Apple's lineup with a Pro suffix. As I mentioned earlier, threading seems to have improved on newer versions of Photoshop. 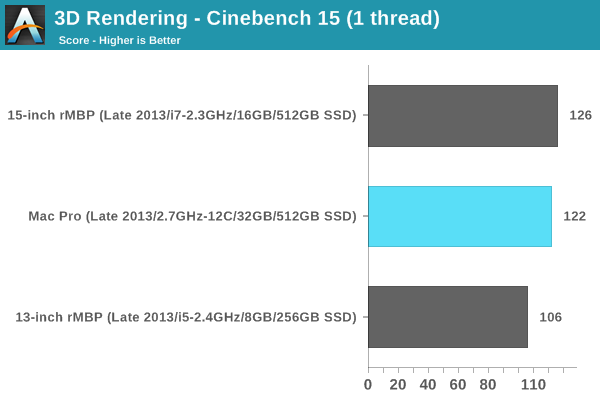 In CS5 our benchmark looks more like a lightly threaded test by comparison. Out of curiosity I ran the test under Photoshop CS6 and came away with a completion time of around 6 seconds. Our Lightroom 3 export test tells a very similar story. 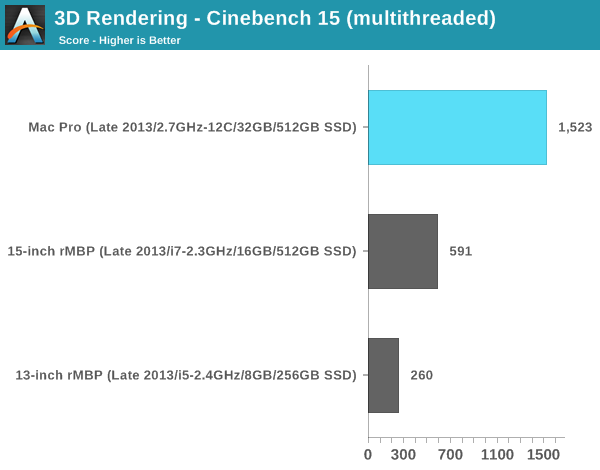 Anyone with lighter workloads looking for a huge performance increase thanks to the Mac Pro will have to look elsewhere. 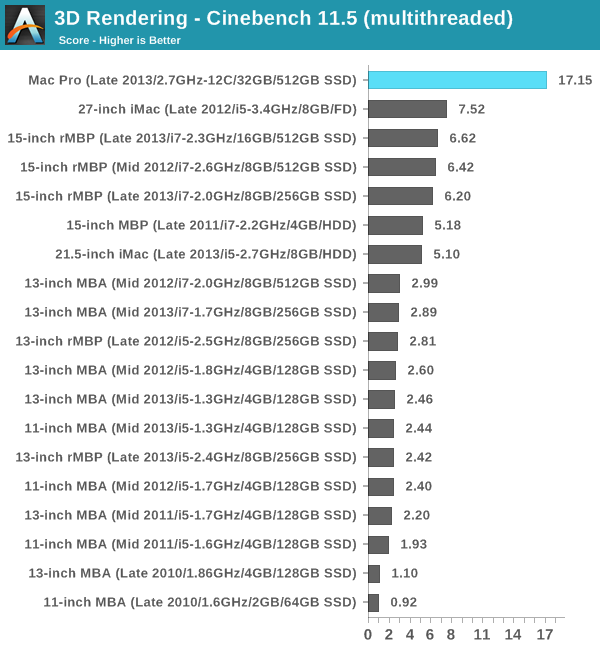 The Mac Pro is at least performance competitive, but in these lightly threaded workloads you won't see a huge uplift.